Jordan Temple of Bourne is bowled during a Jaidka Cup semi-final against Ramsey. He scored a half-century for Bourne on Saturday. Bourne have the chance to exact swift revenge on Nassington in the semi-final of the Stamford KO Shield this evening (June 19, 6.15pm). 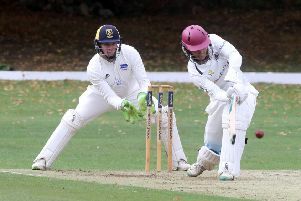 Nassington beat the area’s leading Twenty/20 side in a Stamford Charity Cup semi-final last week (June 12) and they’ve since been boosted by the arrival of Sri Lankan import Mohomad Shifran Muthaliph. Bourne will start strong favourites on their own Abbey Lawns surface even without in-form Sam Evison who is away on his minor counties debut with Lincolnshire. There’s also a quarter-final tie tonight when holders Ketton will expect to beat Ufford Park at Pit Lane. King’s Keys await the winners in the semi-final. There’s a Jaidka Cup semi-final on Wednesday (June 21) when Peterborough Town host Wisbech at Bretton Gate for the right to play Bourne in the final on June 28. Town have been drawn against local rivals Oundle in the quarter-finals of the Northants T20 competition. That match will take place at Bretton Gate on Tuesday, June 27.